There's a bit, about two-thirds of the way through Final Fantasy VII: Advent Children that really sums up the whole movie. Kadaj (the emo bad guy) summons a big nasty dragon, and half a dozen heroes from the game who haven't been in the movie, or even been mentioned in the movie, thus far just show up to help fight it. Who are they? Who cares, it's a cool fight scene. That's Advent Children all over - there's a story in it if you know the game's plot, but if not, it's a hundred minutes of really cool fight scenes. Yuffie Kisaragi is a ninja from the nation of Wutai, who hopes to restore her home to its former glory by gathering materia, which are magic ball thingies that contain spells and summon critters and... y'know, stuff. Cool fight scenes ensue, that's about all you need to know. There's a big block of text on the back of her packaging, but it's in Japanese, so I don't know if it's a character bio or a safety warning - still, it's not strictly necessary that you know who she is, since in the movie all we learn is that she doesn't like people touching her materia (fair enough; I think she may be underage), and she's got Kim Possible's voice. 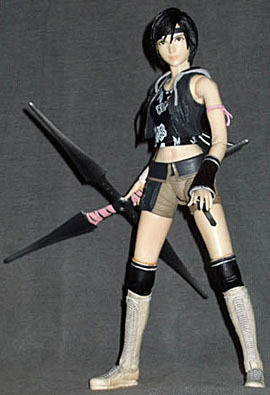 Yuffie is one of three figures in the second wave of Advent Children action figures, the others being Kadaj and Reno (a kind of combat-oriented comic relief). 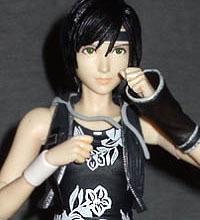 In terms of accuracy to her on-screen appearance, Yuffie is near as dammit the closest to identical that I've ever seen in an action figure - though the fact that Advent Children was all CGI, with humans that looked somewhat action-figure-ish, helps out quite a bit. Still, that's not to take away from the quality of the sculpt - in terms of translating Yuffie from screen to physical form, this figure doesn't miss a beat, from overall appearance, proportions, design and sculpt of clothing, fine details... heck, for what you pay for her, you'd have to be pretty harsh to demand better. Her paint job is high quality too - on first glance, it looks as good as the sculpt, though on closer examination there are a few areas where she's not quite as clean as she could have been. Her skin is all bare plastic, cast in colour - and again, given that she's from a CGI movie, the slightly unnatural smoothness and consistency in tone is actually a good thing. 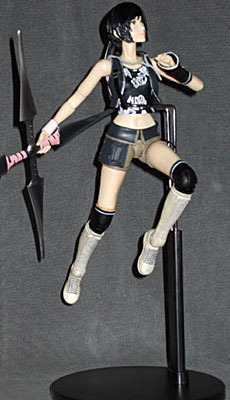 Her clothing is fairly monochromatic, with blacks, dark greys, and cream/whites, subdued brown on her shorts, and only the pink ribbon around her left bicep standing out - it's not the most colourful design, but the lack of colour on her clothes lets her skin be the dominant colour, which is unusual in an action figure, and rather pleasing. The large to mid-size paint applications are all quite professional, and the white flower pattern on her tank top is clean and crisp - slop there would have stood out a mile, so it's just as well - but some of the fine detail is a bit vague. Areas like the zipper on her jacket, the white bands on her kneepads and the bandage around her left forearm, and the lines of dark skin colour at the top of the kneepads (these, along with similar shadows around her wristband and between her fingers, are the only paint apps on her skin) being not as clear as they should have been. Fortunately they're easily overlooked, and where it counts, the fine paintwork is on target. The laces on her boots (which are pretty much the first we see of her in the movie, filling the frame in a low-angle shot) are painted very well, with an ink wash and restrained highlight bringing out the detail without causing slop or overdoing the shadows. And her face is flawless, with subtle shade on the lips, clean and fairly detailed eyes, and even crisp lines on her black and white headband. Her hair - a separate soft plastic piece - is unpainted, but the glossy black looks good and brings out the high level of sculpted detail better than a paint highlight would have. The packaging advertises "over 22 points of articulation," which is true - there's 25, and a lot of them are very versatile joints. First off, she has a neck balljoint - a true ball and socket joint, with an excellent range of motion in all three dimensions, although her hair limits how far back she can tilt her head. Her shoulders are swivel/peg-style balljoints, mounted on a peg-jointed shoulder section that allows her to hunch or stretch her shoulders. She has swivels in her upper arms - on the biceps on her left, where the ribbon is tied around her arm, but closer to the elbow on her right, so as to leave the sculpt of the bare biceps largely unbroken. Balljointed elbows and swivel wrists round out the arms, with a second swivel at the top of the bandage on her left arm, allowing it and the hand inside to be turned independently. She has a lovely mid-torso joint, a true balljoint mounted on a peg joint, so she can twist, lean, and tilt about as much as any figure I've ever seen. Her hips are true balljoints too, but limited by the sculpt of her shorts - they move well, and the skirt-like things hanging off her belt, whatever they are, are soft, so they don't impede the thighs much, but her stance can only go so wide before the joints reach their limit. She has swivels at the bottom of her shorts, peg knees, swivel/peg ankles and peg joints allowing the feet to tilt. The joints supporting a lot of mass, like the mid-torso ball, can become a bit loose over repeated use, but not so much that they won't hold a pose - you just have to be careful not to jar her after you've posed her. That's a lot of articulation, though she's not quite a universally-mobile figure - as I said her hips are a little restricted, and the elbows and knees are only good for about a hundred degrees, far less than a double peg would have given; the elbows aren't bad, but the combined restrictions of hips and knees limit her. On the up side, her design is terrific at concealing articulation: the hair framing her face mostly conceals the neck joint, her jacket almost completely hides the hunch/stretch peg joints in her shoulders, her hips are very low-visibility for balljoints, the "rocker" joints in her feet have the sole of her heel attached to the rest of the foot, not the ankle, so even tilted her feet look pretty much right from the side or back, and the mid-torso joint is completely invisible thanks to her tank top. She's not far from a Marvel Legend in terms of versatility, but she's closer to DC Direct for not sacrificing looks for mobility. Yuffie has four accessories. Most obviously she has her weapon, the largest shuriken I've ever seen. It's a simple sculpt, but done well, and the dark silver paint gives a very good metallic effect. Unfortunately the pink on the handles is applied poorly, with a lot of slop over onto the metal areas between the wrappings, and the areas that are meant to be pink aren't given enough paint to cover the dark base beneath. With the overall standard of the figure being so high, this one issue stands out as a sore point. 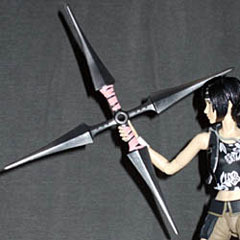 Yuffie's right hand is sculpted to hold the shuriken, by the handle or by the blade - in either case it's easy to work the weapon into place, and the grip is firm enough that it won't fall out on its own. She also has a pair of alternate hands, sculpted in closed fists, with darker skin paint detailing the crevices between her fingers. They're simple but good, although with no wrist hinge, the right hand's inward tilt limits how many realistic-looking poses her arms can have with the fist in place. Both sets of hands sit firmly in their sockets, but excess force isn't required to pop them in and out, and the pegs are thick enough that breakage from repeated swapping shouldn't be an issue. Although the bandage on the left forearm is sculpted to accommodate the open hand, it looks decent over the closed fist as well. Finally there's the base. Like almost everyone in Advent Children, Yuffie regards gravity and inertia as suggestions of physics rather than laws, so the base is of the waist clamp variety, allowing her to be displayed doing Crazy Flying Ninja Stuff™. The clamp ratchets vertically for stability - it's not quite low enough, at its lowest point, to hold her with her feet on the ground, but that's not necessary, as her foot articulation allows her to stand stably in most poses. At its highest extent the base will hold her with her feet about 3" off the ground. It's not a true flying stand though, and the clamp's "spine" is close enough behind her that it can get in the way if you try to pose her leaping forward, with her waist and legs tilted backward. Bottom line, aside from that one paint issue on her weapon, she's an excellent figure - a great combination of design, sculpt, paint, and articulation. She may cost a bit more than your average action figure, but she's worth every cent. Just don't touch her materia.